FRUSTRATED BY SENATE obstructionists who have vowed to block future presidential nominations, Barack Obama side-stepped opposing lawmakers by making four recess appointments January 4. The move infuriated Republicans while delighting labor unions and consumer groups. ​Obama named three people to serve on the National Labor Relations Board. Two are Democrats: Deputy Labor Secretary Sharon Block and labor attorney Richard Griffin. The other nominee, NLRB counsel Terrence Flynn, is a Republican. ​The NLRB appointments restore the board to its full complement of five members. At least three are needed to conduct the regular business of enforcing labor laws and overseeing union elections. That number had dropped to two in December, when Craig Becker’s recess appointment expired, leaving the board without a quorum. ​Republican lawmakers have been at odds with the NLRB over its recent actions, including a regulation requiring employers to post notices about employee rights to join a union, a regulation to speed up organizing elections, and a position in favor of the Machinists union, which had filed an unfair labor practice (ULP) charge against Boeing for moving manufacturing work to South Carolina, a right to work state. 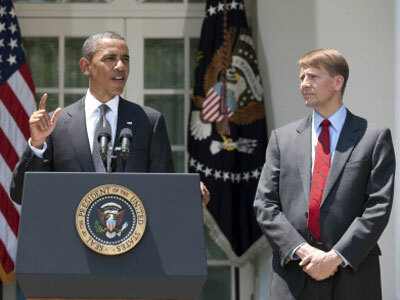 ​Obama’s adversaries are also angry over the appointment of former Ohio attorney general Richard Cordray to direct the new Consumer Financial Protection Bureau, which is aimed at reducing predatory lending practices among other things. Republicans had hoped to keep the bureau from doing its intended work by refusing to confirm Cordray’s nomination. ​Although recess appointments are provided for in the U.S. Constitution, both Democratic and Republican lawmakers have attempted to curtail them in recent years using a procedural tactic. The procedure requires one or more senators to enter the chamber and “bang the gavel” every three days. That simple act supposedly keeps the Senate in session, although in reality few if any senators are even in town. The tactic worked successfully against George W. Bush. However, Obama’s January 4 appointments challenge the constitutionality of the procedure. ​Republicans have threatened legal action.